So at Tiny House Summer Camp 5 in Northern Vermont (one of the only hands-on tiny house workshops in the US hosted by The Diedricksen Brothers), we had a chance (attendees and hosts alike) to tour quite a few tiny houses, campers, and THIS, tiny, tiny vardo (or "gypsy wagon")- one built and designed by New Jersey resident Chris Schapdick. The particular Vardo was built as a show and travel model for Chris and his new venture- "Tiny Industrial"- and in this video he goes on to explain how- trailer included- Chris will soon be offering builds in the ballpark of $5000.00. Be sure to check out all the custom details in this model too, from the exotic woods, to the copper-pipe assembled cabinet hardware, and the gorgeous little table and sitting space. Its spartan, yes, but its affordable, good looking, sleek, and PORTABLE, shelter. 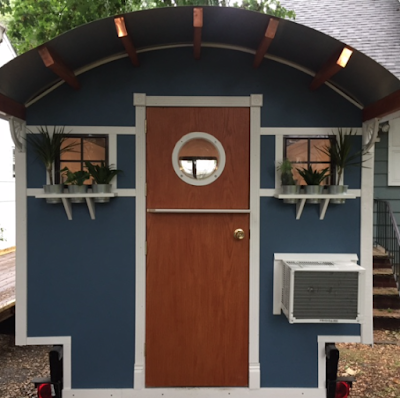 AND YES, SEPTEMBER of 2018 WILL bring another "Tiny House Summer Camp"- our SIXTH YEAR!